Since the beginning of human civilization, the intrinsic beauty, warmth, sensuality and spiritual richness of gold has earned it a unique place of pride among members of elite societies around the world.It has long represented the highest values both material and mystical,from the rarest objects of desire to the source of immortality and always the most enduring symbol of status. Its rarity and beauty are reflected through not only its high desirability, but also its value across cultures and throughout history, providing proof of gold’s timeless essence. It is the unique history of gold that is the source of inspiration behind Prima Gold. In 1992,the Pranda Group set out to develop a new pinnacle in purity for gold jewelry as well as a reflection of the dedication to bring out the everlasting essence of gold, and making that essence available to those that shared the same passion. The result is not just any ordinary gold jewelry; it was the birth of Prima Gold, absolute pure gold jewelry in 24K with 99.9% purity. 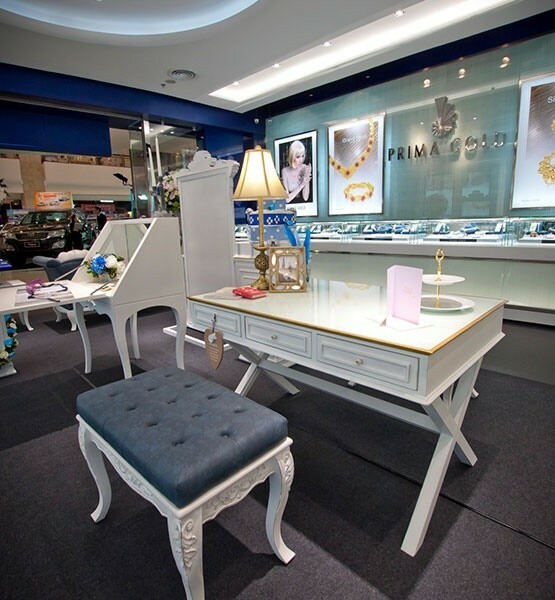 The first Prima Gold flagship shop was opened on December 1992 in Bangkok, Thailand, and since then the World has witnessed a new era of pure gold jewelry. Imagining beyond the ordinary creates a vision; Prima Gold is the result of a vision to create extraordinary gold jewelry. The result of thorough research and advanced technologies, Prima Gold emerge as the gold jewelry masterpieces of exceptional standard. Breaking free from the common gold jewelry and styles on the market, Prima Gold are distinctive jewelry pieces and collections in the purest form, exclusively using 24K pure gold.